The workspace of a Stewart platform is a complex six- dimensional volume embedded in the Cartesian space defined b y six pose parameters. Because of its large dimension and com- plex shape, such workspace is difficult to compute and repres ent, so that comprehension on its structure is being gained by stu dy- ing its three-dimensional slices. While successful method s have been given to determine the constant-orientation slice, th e com- putation and appropriate visualization of the constant-po sition slice (also known as the orientation workspace) has proved t o be a challenging task. This paper presents a unified method fo r computing both of such slices, and any other ones defined by fixing three pose parameters, on general Stewart platforms i n- volving mechanical limits on the active and passive joints. Ad- ditional advantages over previous methods include the abil ity to determine all connected components of the workspace, and an y motion barriers present in its interior. 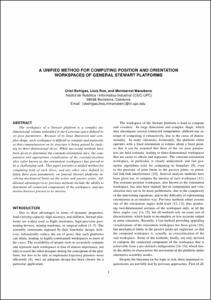 Bohigas, O.; Ros, L.; Manubens, M. A unified method for computing position and orientation workspaces of general Stewart platforms. A: ASME International Design Engineering Technical Conferences & Computers and Information in Engineering Conference. "Proceedings of the ASME 2011 International Design Engineering Technical Conferences & Computers and Information in Engineering Conference". Washington: 2011, p. 959-968.